The Chavin people are known for and named after their artistic style, and their art was greatly influenced by their religion. Their most notable pieces of artwork were the impressive stone carvings the Chavins made, however they were also known for their mastery in working with gold, textiles, and ceramic. 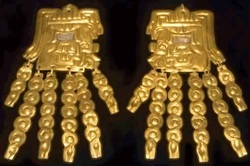 It is also believed that the Chavin people also made use of iconography in their artwork to convey religious meaning. Chavin architecture was also very impressive for its time, including waterways and secret passages that were advanced for its time.